Twitter is one of the most influential and helpful social media platforms to be active on with your brand. Chances are if you're a brand that wants to make an impact on your customers, and connect with them on a more personal level, you are already using Twitter. But have you ever noticed how some brands have that little blue check mark beside their name, while others don't? This is what's known as a Verified account, and it distinguishes the influencers, brands, and famous people from every other user. In the past, Twitter's verification process has been a bit ambiguous, with the brand having almost no say on whether or not they could get a verified badge on their profile. Twitter would decide on its own whether or not an account needed a verified badge. However, recently Twitter has opened up the verification process to everyone, allowing people to submit an application to Twitter in order to be verified! Of course, this doesn't mean that everyone who applies will be automatically recognized by Twitter as an account that deserves verification, but it's definitely a good place to start for many brands who've been waiting anxiously for that little blue check mark. So, I've explained what Twitter verification is, but why does it matter for your business or your brand? Here are a few reasons why you should be taking steps to verify your account. People like to know that the person they're following, interacting with, and trusting is the real deal. The internet, and especially Twitter, is full of spam and parody accounts that exist as a way to satirize actual celebrities and brands. The Twitter verification badge allows users to know which accounts are real, and which ones are fake. All they have to do is spot your badge, and they know that they are following a credible account instead of one of the many "troll" accounts. It also lets your followers know that your brand is established enough to qualify for a badge. There are some businesses out there who have yet to receive a blue verification badge, which can make them seem like they aren't a credible account, and can't be trusted. There's nothing more important than giving off a sense of credibility to your customers. Before this new verification, verified Twitter accounts used to be a lot more exclusive. Although this is now changing, verified accounts are still a pretty exclusive club, consisting of well-known brands and celebrities such as Kanye West, NASA, President Barack Obama, Target, Rolling Stone Magazine, etc. Getting verified puts you in the same category of influence as other verified accounts, and, again, makes you seem more trustworthy to consumers. Think about this for a second: say you're on Twitter looking through your timeline when all of a sudden you get a notification saying that such-and-such business has sent you a direct message (or DM). You look at their profile and notice they don't have a verification check mark. Do you respond to them? Would you trust them, knowing that they might be trying to hack and steal sensitive info? This is how most customers would approach the situation if they see you're not verified. This makes it even harder to connect with your consumers, and interact with them the way social media was intended. A blue verification badge gives your customers the peace of mind they need to trust you if you ever need to reach out to them personally. 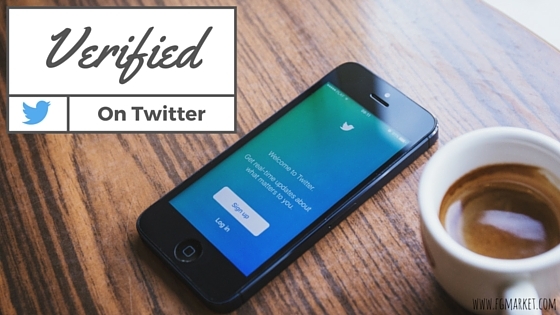 Twitter verification is now easier than ever, and as you can see, can be greatly influential on the success of your business. If you're ready to get your Twitter account verified, just click here to fill out the application form! This article was originally published on FGmarket. Check out their website for great wholesale vendor prices, and more blog posts like this one!